Mainz (Germany), April 17, 2013 – Infrared lasers are increasingly being used in medicine and industry. In order to protect the eyes from injuries, special filter glass is needed. SCHOTT’s 1 mm thin band-pass filter VG20 shows strong absorption in the near infrared (NIR) range. Its outstanding transmittance in the visible spectrum ensures colorfast eyesight, as well. "By bringing more color into the glass, we have been able to produce a very thin optical filter to keep radiation in the wavelength range from 600 to 1100 nm away from the eye," explains Dr.-Ing. Ralf Biertümpfel, Application Manager Filter Glass at SCHOTT Advanced Optics. "For laser safety eyewear, VG20 offers improved wearing comfort – it is roughly one third lighter than conventional filter glass." VG20 is extremely transparent in the visible range of the electromagnetic spectrum: It conveys true colors with very little darkening. The cut-off wavelength 05, at which the glass has a transmittance of 50 percent, is at 565 nm and then drops steeply. From 750 to 1100 nm, the green glass is nearly impenetrable. 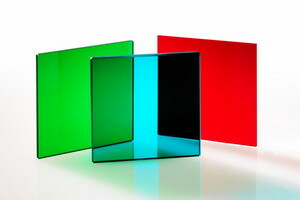 Regardless of the angle of incidence, the solid-colored glass safely protects from laser beams. In addition, the filter glass is highly climate-resistant: it stays moisture- and heat-proof, permanently transparent, and corrosion-free for hundreds of hours. For customer-specific applications, the filter properties can be optimized with additional coatings. VG20 is suitable for protection from red and NIR lasers in a wavelength range above 650 nm – for instance in metrology and medical technology. Photo no. 198502: SCHOTT’s 1 mm thin band-pass filter VG20 shows strong absorption in the near infrared (NIR). Its outstanding transmittance in the visible spectrum ensures colorfast eyesight. Source: SCHOTT. Capacity to expand by more than 50 percent / Consistent investment strategy helps customers achieve growth and quality objectives Mainz/Moscow, November 26, 2012 – SCHOTT Pharmaceutical Packaging continues to experience growth in Russia and now plans to increase the production capacities at its plant in in Zavolzhe by more than 50 percent. Mainz/Moscow, November 26, 2012 – SCHOTT Pharmaceutical Packaging continues to experience growth in Russia and now plans to increase the production capacities at its plant in in Zavolzhe by more than 50 percent. The manufacturer announced this move today at the Pharmtech trade fair in Moscow. “Expanding our presence in Russia represents an important strategic step for the benefit of our customers,” emphasizes Prof. Udo Ungeheuer, Chairman of the Board of Management of SCHOTT AG. “We are seeing continued growth in demand for locally manufactured primary packaging that also meets all of the international standards for quality. This will result in shorter delivery routes and better export opportunities for our customers. In other words, by pursuing a consistent investment strategy, we will be helping our customers in the Russian pharmaceutical industry to achieve their own growth and quality objectives,” he adds. The Russian pharmaceutical industry has experienced double-digit growth in recent years. State initiatives like the government’s “Pharma 2020” strategy that seeks to encourage local manufacturing of high-quality medications according to the GMP standard (“Good Manufacturing Practice”) will continue this development. SCHOTT became the first international manufacturer in Russia to open a new GMP-compliant pharmaceutical packaging plant in the spring of 2011 and it has been a great success. After all, the order situation has made it necessary to expand capacities earlier than expected. By setting up new production lines for vials and ampoules, SCHOTT has now demonstrated consistency in taking the next step toward continuing to offer its Russian customers shorter delivery times. “Thanks to our many years of experience and high international standards for quality, SCHOTT is the right partner for the ambitious and growing Russian pharmaceutical industry,” Ungeheuer adds. Here, he is referring to the growing quality requirements of the Russian pharmaceutical industry. “GMP will be required by law for all companies that manufacture in Russia starting in 2014 and SCHOTT has the necessary know-how on helping its customers to establish GMP-certified manufacturing thanks to its 125 years of experience and global manufacturing network,” Ungeheuer concludes. SCHOTT Pharmaceutical Systems is one of the world’s leading suppliers of glass tubing and primary packaging for the pharmaceutical industry. We provide our customers with quality solutions while meeting their highest demands with our material expertise, specialized analytical lab services, and a broad product portfolio, including syringes, cartridges, vials, ampoules, and special articles made of glass and COC polymer. With five glass tubing production sites and fifteen sites for pharmaceutical packaging spread over four continents, we are a reliable supplier that offers local service. Our state-of-the-art production facilities and products comply with the highest international quality standards for pharmaceutical needs. 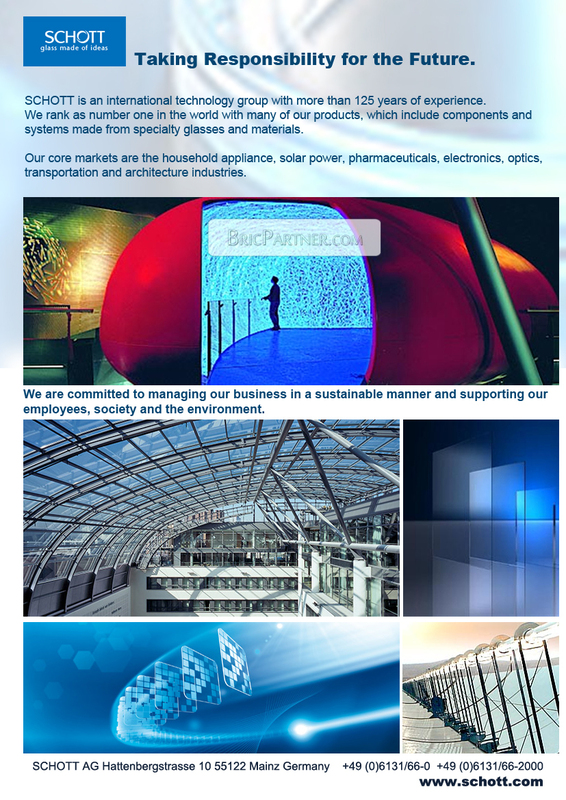 SCHOTT is an international technology group with more than 125 years of experience in the areas of specialty glasses and materials and advanced technologies. SCHOTT ranks number one in the world with many of its products. Its core markets are the household appliance, solar power, pharmaceuticals, electronics, optics, transportation and architecture industries. The company is strongly committed to contributing to its customers’ success and making SCHOTT an important part of people’s lives with high-quality products and intelligent solutions. SCHOTT is committed to managing its business in a sustainable manner and supporting its employees, society and the environment. The SCHOTT Group maintains close proximity to its customers with manufacturing and sales units in all major markets. Its workforce of around 17,000 employees generated worldwide sales of approximately 2.9 billion euros for the 2010/2011 fiscal year. SCHOTT AG, with its headquarters in Mainz (Germany) is owned by the Carl Zeiss Foundation. India’s leading home appliance manufacturer TTK Prestige Ltd. and German specialty glass producer and technology company SCHOTT AG team up for a strategic partnership: Together, they target India’s high growth market for high-quality cooking appliances. The two market leaders in their respective fields announced their collaboration at a press conference in Bangalore today. Prestige is introducing its new range of premium cooking appliances under the brand Prestige Premia, a product line which combines SCHOTT’s world renowned high quality products and TTK Prestige’s innovations for its cooking appliances. Two categories of products are being launched: SCHOTT CERAN® glass-ceramic cook-tops for high end Prestige Premia induction cookers and gas stoves made from SCHOTT tempered flat glass hobtops. “Indian consumers are growing to be quality conscious and there is a need for appliances that are smart and long lasting products. 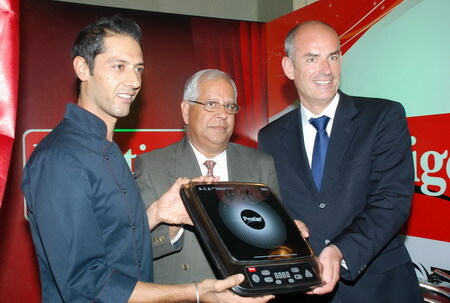 Prestige Premia cooking appliances is the first kitchen appliances brand in India to address the growing desire for superior products which combines Prestige’s innovation streak and manufacturing expertise with SCHOTT’s world-class German technology to deliver a formula for joint success”, TT Jagannathan, Chairman of TTK Prestige Ltd., said. “The market entry of SCHOTT CERAN® and SCHOTT Flat Glass in India marks the beginning of a new era for us. We could not have found a better partner than TTK to expand our business in this high growth market. The market entry of CERAN® and SCHOTT Flat Glass in cooperation with India’s top household appliances player creates great opportunities for us. Together, we now offer Indian consumers new products of unrivaled quality,” Professor Udo Ungeheuer, Chairman of the Management Board at SCHOTT AG, explained. SCHOTT combines more than 125 years of glass development and production experience with German engineering know-how and top manufacturing standards. This results in high-quality sustainable glass-ceramic and glass products which represent the best on the world market. SCHOTT uses an advanced toughening process to ensure high impact resistance and temperature resistance: both its glass-ceramic as well as its tempered flat glass are highly durable and are tested to withstand bigger thermal shocks and mechanical impacts than any other glass. The products are reliable and safe, and are produced in an ecologically friendly production process. That is how SCHOTT lives up to its promise of offering sustainable products to its customers and consumers – in various senses. Supported by SCHOTT’s superior printing quality along with its innovative and stylish designs, TTK’s new Prestige Premia induction cook-tops and gas ranges now add to the elegance and convenience of modern Indian kitchens. The smooth finish of the products also makes them a lot easier to keep clean. TTK Prestige Ltd., has emerged as India’s fastest growing and largest kitchen appliances company catering to the needs of home makers in the country. The company has a varied product portfolio ranging from pressure cookers, non-stick cookware, and gas stoves to electrical appliances and kitchen tools. Prestige has three manufacturing facilities in India and was also the first Kitchenware Company in India to receive the ISO 9001 Certification and the PED/CE Certification by TUV, Germany. TTK Prestige Ltd., part of the Rs. 2500 crore (approx.. 450 million US dollars) TTK Group, is listed on Mumbai’s BSE and NSE stock exchanges. SCHOTT CERAN® is an internationally recognized brand name that stands for high technical and aesthetic quality cooking range glass ceramic applications. SCHOTT has sold more than 111 million pieces world-wide since its introduction in 1971. 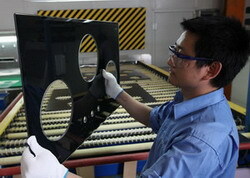 The sophisticated raw materials that go into CERAN® were originally developed for space telescope mirror substrates. The result is a glass-ceramic exceedingly precise, with almost zero thermal expansion and high temperature resistance. Furthermore, SCHOTT has refined its patented melting process to produce CERAN® without the use of the toxic heavy metals arsenic or antimony. For this ecologically conscious manufacturing method and its insistence on creating environmentally friendly products, SCHOTT won the German Innovation Prize 2010 and was placed within the top three products at the German Sustainability Awards 2011. SCHOTT Flat Glass products are used in many different applications in both kitchen and living room environments, as well as for commercial presentation of refrigerated food products. The product portfolio ranges from standard glasses to sophisticated glass components for gas cookers, baking ovens, refrigerators and other appliances as well as complete system solutions for commercial refrigeration. Thanks to its many years of experience, SCHOTT is a leading player in this field and has a great deal of specialized knowledge and offers customers the full range of products, including customized and innovative solutions. SCHOTT CERAN® is a registered trademark of SCHOTT AG. SCHOTT is hoping to continue to grow in Asia. The technology group is already present with ten plants in this region, one of which is based in Suzhou, China. The international technology group SCHOTT will be seeking to defy the slowdown in economic growth with the help of its strong core businesses, continued innovations and stronger presence in Asia in 2012. “We are in a good position to be able to achieve a modest increase in sales in fiscal year 2011/2012. We generate well over half of our sales in areas in which we rank among the world’s leaders. This will provide us with many promising opportunities in our markets, even though the environment is quite difficult at the moment,” Prof. Udo Ungeheuer, Chairman of the Board of Management, noted at the annual results press conference. In fiscal year 2010/2011 (October 1, 2010, - September 30, 2011), the weakening of the global economy that first surfaced in the 3rd quarter had a negative impact on business, particularly due to the fact that SCHOTT generates almost 80 percent of its sales outside Germany. Nevertheless, the company managed to increase its sales by 1 percent to €2.88 billion, thanks mainly to its broad product portfolio. “We are quite pleased with this increase in sales. After all, we had to go up against an excellent previous year in which we increased our sales by 26 percent,” Ungeheuer added. Annual net profit reached €109 million and was thus even higher than last year (€108 million). The group invested €140 million in tangible assets (2010/2011: €181 million), somewhat more than half of which was spent in Germany. The company had 17,180 employees as of the September 30, 2011, balance sheet date, (2009/2010: 17,450). Compared to the previous year, the company increased its expenditures on research and development by 8 percent to €106 million, to establish the prerequisites for further growth. The development of the individual divisions varied in the fiscal year that just ended. Electronic Packaging, Pharmaceutical Systems and Advanced Materials were among the units that experienced growth. Sales at Home Tech were lower than last year due to a large order that was filled on schedule. The Photovoltaics business was impacted by significant excess capacity in the marketplace and continued price erosion. Nevertheless, SCHOTT still managed to increase its sales of photovoltaic modules by a double-digit percentage. In fiscal year 2011/2012, the company expects to see its core businesses for the most part drive growth. These include the Home Tech division with its strong brands “Ceran” glass-ceramic cooktop panels and “Robax” fireplace viewing panels, but also the Pharmaceutical Systems division with “Fiolax” special glass tubing and pharmaceutical packaging. The new pharmaceutical packaging plants in Argentina and Russia that were put into operation only last year are also expected to contribute to growth. Manufacturing capacities will be expanded in India in 2012 when a new plant is put into operation, but also through a joint venture together with a leading local manufacturer of pharmaceutical packaging in China. SCHOTT ranks among the world’s leaders in this field with the more than 7 billion syringes, ampoules, vials and cartridges it manufactures each year. The topic of “green products” is also becoming increasingly important. Here, the SCHOTT product line already includes a number of products that are manufactured without using arsenic and antimony as additives. Furthermore, with “Ceran Hightrans” Eco, the company ranks as a pioneer when it comes to environmentally friendly manufacturing of black glass-ceramic cooktop panels. By being recognized with the “German Innovation Award 2010” and ranking among the top 3 in the “German Sustainability Award 2011” competition, “Ceran” received public recognition for the development and realization of innovative and environmentally friendly technologies. The Photovoltaics division continues to harbor uncertainties. By withdrawing from manufacturing of wafers and cells, SCHOTT recently disassociated itself from levels of the value creation chain that are no longer profitable in order to be able to concentrate on its module and project business that are closer to the market. These activities will now concentrate on manufacturing premium-quality solar modules that have long been known for their high quality and durability, but also on planning, marketing and operating large-scale photovoltaic plants. Specific projects have either already been completed or are still underway in Germany, France, Greece and Thailand, among other regions. The company plans to continue its research work on new, high-efficiency technologies for monocrystalline wafers, cells and solar modules. In fact, the results are already being put to use in high-performance modules that will be launched in the first half of 2012. Besides innovations in the area of photovoltaics, SCHOTT also sees excellent prospects for its newly introduced, extremely hard display glass “SCHOTT Xensation” Cover that can be used in smartphones and tablet PCs, for example. Today, roughly 40 percent of all mobile communications devices are already equipped with a touchscreen and the trend continues to point upwards with double-digit annual growth. The company also expects its new, high-purity glass fiber “Puravis” to grow to become an important source of revenue. “With this innovation, we raise the bar in the area of optical glass fibers for use in medical and industrial applications much higher than it ever has been before,” Ungeheuer said. SCHOTT also sees potential in other innovations, including a series of new optical glasses for use in measurement and medical technology, but also fireplace viewing panels that can now be bent by up to 90° to enable undisturbed viewing of the fireplace from virtually anywhere in the room, for instance. SCHOTT expects to see growth impulses for its business come mainly from Asia in 2012. The economic growth in this region, and China, in particular, is considerably higher than in Europe and North America. SCHOTT already has ten manufacturing sites and twelve sales companies in Asia that currently employ a staff of 3,000. Asia already managed to increase its share of group sales to 23.9 percent in fiscal year 2010/2011. This figure should rise to more than 25 percent this fiscal year. Ungeheuer views this development as confirmation of the company’s long-term growth strategy in this region with a strong focus on Japan, China and India. SCHOTT plans to keep its investments in tangible assets at a high level in fiscal year 2011/2012 as well. €170 million in global spending is already planned. The main focus will be on the group divisions Pharmaceutical Systems, Home Tech and Optics.